ASP.NET is an open-source server-side Web application framework designed for Web development to produce dynamic Web pages. It was developed by Microsoft to allow programmers to build dynamic web sites, web applications and web services.It was first released in January 2002 with version 1.0 of the .NET Framework, and is the successor to Microsoft's Active Server Pages (ASP) technology. ASP.NET is built on the Common Language Runtime (CLR), allowing programmers to write ASP.NET code using any supported .NET language. 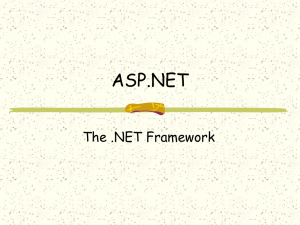 The ASP.NET SOAP extension framework allows ASP.NET components to process SOAP messages.ASP.NET is in the process of being re-implemented as a modern and modular web framework, together with other frameworks like Entity Framework. The new framework will make use of the new open-source .NET Compiler Platform (code-name ""Roslyn"") and be cross platform. ASP.NET MVC, ASP.NET Web API, and ASP.NET Web Pages (a platform using only Razor pages) will merge into a unified MVC 6. The project is called ""ASP.NET vNext"".